I could write ad nauseam about the experience – about the unparalleled hospitality of distant cousins and family friends; the bottomless jugs of homemade wine and never-ending courses of local dishes; the ancient, gnarled olive trees and cobblestone streets that glow and delight the eye in the evening sunset. And for the genealogist, there is a distinct benefit to walking in the footsteps of your ancestors – nearly every road will lead to the town hall, where decades, sometime centuries, of vital records sit at your fingertips. Exploring the details of these original records, rather than extracts, certified copies, or indexes, is the subject of this post. Negotiating with the town administrator in person is not an easy task, but the face-to-face exchange inevitably yields better results than an email, letter, or phone call, particularly when exploring genealogy in a foreign country. Of course, hopping on a plane and driving over mountain ranges isn’t something most people do on a whim. I always implore travelers, however, to make a sincere attempt to visit their ancestral town(s) if they are in the country where their ancestors were born. Taking an afternoon or a few days to get away from the tourist destinations is well worth any inconveniences renting a car may incur. Of course, hopping on a plane and driving over mountain ranges isn’t something most people do on a whim. Although I am not fluent in Italian, I studied the language formally for a few years and can carry on a conversation. Even someone with very elementary foreign language skills can make genealogical progress abroad, however. A few tips I have learned through my own experiences are 1) Have as many details as possible before your arrival – birth dates, marriage dates, name of parents, etc. 2) Rehearse what you are going to say in the clerk’s native language (ask a friend when in doubt, rather than using Google Translate! ), and 3) Don’t request too many records at once. I set parameters that I would request to review civil records for my great-grandparents and their children only (even though my ancestors lived in the town going back to the 1500s). I must admit, since we stayed in the town for a few days, I did visit on more than one occasion. My grandfather’s mother and father were both born in Pentima, now known as Corfinio, in the province of L’Aquila, in Abruzzo, Italy – about an hour and a half east of Rome. Alessandro Ferzoco, my great-grandfather and namesake, was born 21 February 1883. His wife, my great-grandmother Agata Tiberi, was born 5 February 1884. They were married 30 November 1903, and had two children in Italy, Pasquale and Cesira. In 1909 Alessandro immigrated to Boston, and in 1911 his wife and two children followed. In the subsequent years, they had seven more children in Boston, including my grandfather in 1918. Their descendants number more than two hundred and twenty. 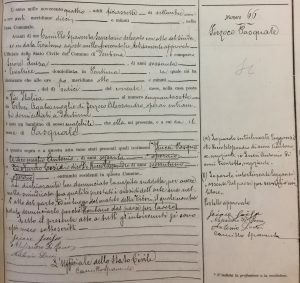 First, my great-grandfather Alessandro Ferzoco was “assente dal paese per servizio militare” – absent from the town for military service – when his son Pasquale was born. I had heard before that my great-grandfather had been in the Italian army, but I had no documented proof. 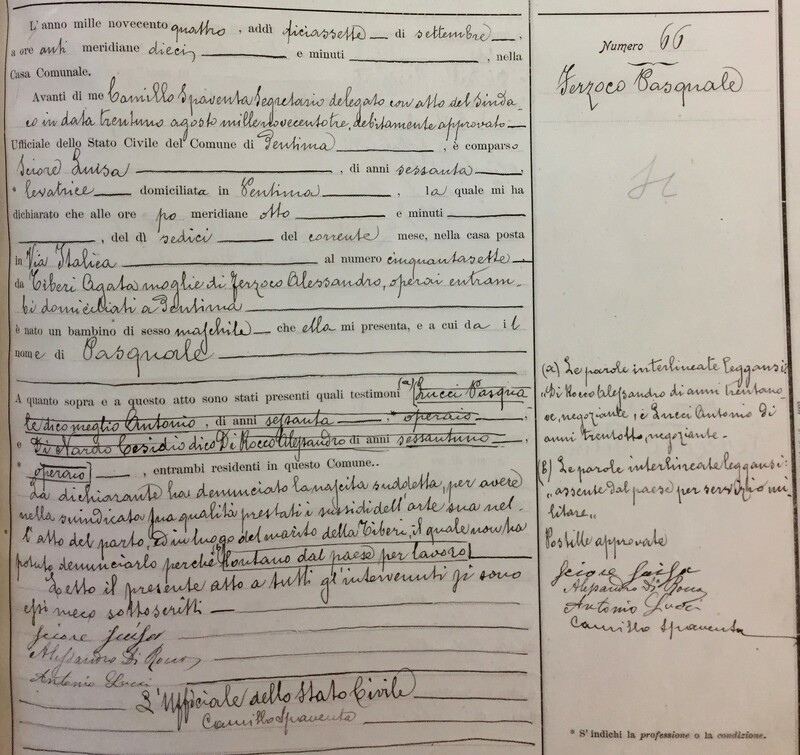 After finding this detail on Pasquale’s birth record, I hired an Italian researcher to visit a local archive for me and to review the military records there. My researcher confirmed that my great-grandfather had indeed been conscripted into the army upon his return to Italy. He was registered as a candidate for military service on 12 October 1903. Alessandro married six weeks later, and sometime in 1904, possibly before his wife knew she was pregnant, he was called to report for service. He served as an infantryman in the Royal Italian Army. Unfortunately the record that details his complete service does not survive. 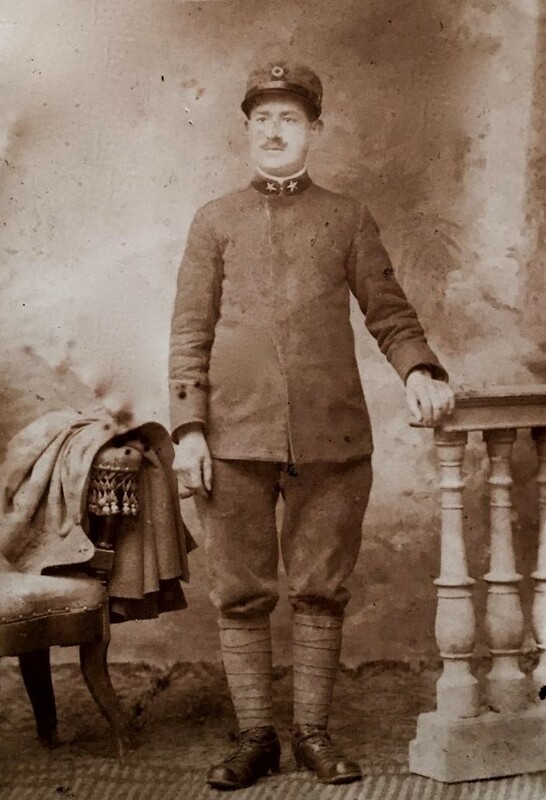 Still, as it turned out, my father’s cousins had a photo of Alessandro Ferzoco at age twenty-one in uniform in early 1904. Alessandro married six weeks later, and sometime in 1904, possibly before his wife knew she was pregnant, he was called to report for service. Alessandro had emigrated to the United States for the first time when he was seventeen, and thus avoided required mandatory service, which typically began at age eighteen. Upon hearing of his return to Italy, local officials must have notified military authorities, who promptly drafted him into the army. It is likely that he served for two years, and that my great-grandmother Agata Tiberi would have raised their son largely on her own. Because Alessandro Ferzoco was not present at the birth of his first son, he could not fufill the fatherly obligation of appearing at the town hall to report the birth of a child, so that a civil record would be made. 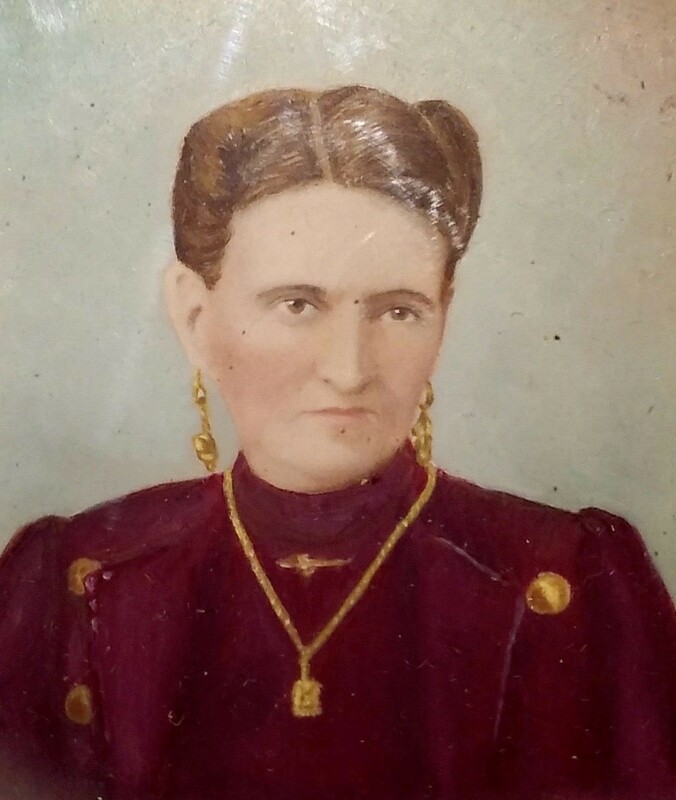 Instead, the midwife who helped my great-grandmother through the delivery, Luisa Sciore, age sixty, appeared and declared the birth of the child. Sciore is not a surname typical of the town, and the name caught my attention. Since Luisa could sign her name on the birth record, I became particularly intrigued with this character. I had been consulting with another researcher, Lynn Eramo, who was researching the same town in Italy that same spring. Lynn had granted me permission to view her family tree on Ancestry.com, and had begun entering information from civil records (1809–1865) to make a master tree for the town. You can imagine my surprise when I searched for Luisa Sciore and realized that she was Lynn’s own great-great-grandmother! Luisa Sciore was born 13 April 1841 in the nearby town of Sulmona, and appears to have traveled as a midwife. Her husband had roots in Corfinio. Connections continued to emerge – Lynn is a neighbor of my first cousin, who doesn’t share my surname. Of course, I immediately sent an email to Lynn. She was delighted to learn that her ancestor lived until at least 1904 and to have a copy of Luisa’s signature. She promptly sent along an image of her great-great-grandmother, which had been in the possession of a distant relative. I in turn forwarded the image to Pasquale’s daughter, my father’s first cousin, who was of course thrilled to see the face of the woman who had delivered her father. Connections continued to emerge – Lynn is a neighbor of my first cousin, who doesn’t share my surname. Perhaps the most amusing connection is that Lynn is also a DNA match and distant cousin of my colleague here in the Research Services Department at NEHGS, James Heffernan. They likely share an ancestor who lived in Ortona dei Marsi, a town not too far from Corfinio. You never know what you’ll find once you start digging! 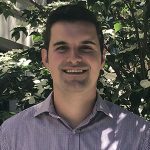 Alessandro–I read your Vita-Brevis post with great interest. I, too, visited Italy in September/October of this past year for genealogical research on my wife’s family. The primary subject was her grandfather, Antonio Vistarini, who was born in Albano Laziale, Province di Roma, in 1897, and also was involved in WWI. I was lucky with the help of two archivists whom I contracted, to find both his military record, which stated he was wounded, and the most amazing find kept at the Archivio di Stato, Roma–his Ministero dell Interno, Il casellario politico centrale file, which were various documents relating to secret police surveillance. Antonio was a communist film-maker in Mussolini’s fascist state. He fled to Madrid, Spain and teamed up with the Popular Front as chief cameraman for the El Campesino brigade during the Spanish Civil War. I am translating and analyzing the documents now, which provides insight into one ancestor’s experience in the years before WWII. I was also able to contact his great niece, my wife’s 2nd cousin, who provided some family stories about his brothers. Wow! What a great story. Thanks for writing it up. What I love about genealogy is just that. Indeed you never know what you will find. My husband’s grandparents came from Sulmona. He came about 1887 and she came in 1897 with a couple who might have been his parents and her brother and married very soon after she arrived. Would love to visit that area. Abruzzo is a beautiful region, and quite accessible from Rome. I highly recommend visiting! Be sure to explore the possibility that your husband’s relatives were from a smaller town near Sulmona. Many American records say that my ancestors were from L’Aquila (the name of the province could be confused with Abruzzo’s capital city). Many family stories suggested that my ancestors were from Sulmona, although they were of course from Corfinio. Sulmona is also the name of the diocese. Alessandro, it seems like you and I are in the same boat! In 2012 I visited the town where my grandmother was from, San Mango D’Aquino, though it seems like you had more success with the Anagrafe than I did while I was there. Catanzaro, my grandmothers ancestral province and L’Aquila also seem to share a distinction of only having consultable records from 1809-1865. Have you been able to take your family on that side back to that period? It took my a long time to do that with my grandmothers family. Many letters resulted in two marriage certificates from 1898 and 1902 which proved to be the breakthroughs to getting to that period. From there it has been better, but so easy to come up against walls with ancestors married before 1809 who died after 1860! Daniel, like you I had many “missing links” between my immigrant ancestors and those relatives who appeared on civil records from 1809-1865. While you can try writing to the comune for records after 1865, town officials are notorious for not responding to inquiries. Of course, visiting in person is the most effective way to acquire a recent record, although it seems you had difficulty acquiring records when you visited.You may also consider contacting the parish priest. Parish records could reveal baptism, marriage, and death information from after 1865. Parish records from before 1809 are likely held in an archive run by the diocese (often not in the town), but those records could document ancestors going back hundreds of years if they exist.